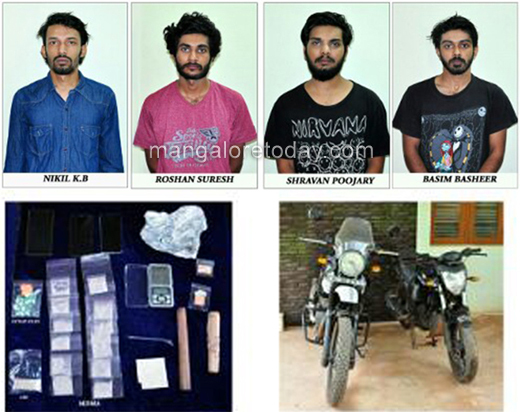 Mangaluru, Oct 26, 2017: Mangaluru South Sub-Divisional Anti Rowdy squad on October 26, Thursday claimed to have busted a drug trafficking racket by arresting fours youths peddling with drugs in the city. The arrested are identified as Nikhil K B (24) of Kanhangad, an engineering student of a College in the city. Shravan Poojary (23)of Kulshekar, BE student of 2015 batch. Roshan Veigas (22) of Kannur and Bashim Basheer (22) of Thrissur, 3rd year MBBS students of a College in the city. ACP of Mangaluru South Sub-Divisional Anti Rowdy Squad had recieved information about dealing of banned drugs in the city. Acting on tip police have taken four youths into custody. They have seized 900 grams of MDMA (Methylenedioxymethamphetamine) powder, 185 LSD (Lysergic acid diethylamide) stamps, 25 MDMA pills, an electronic weighing scale used to measure the drugs, four mobile phones, two bikes and two ’hookahs’, a total worth of Rs 5,30,500 from possession . Case has been registered for further investigations.